May 3, 2014 April 1, 2016 - by nmurshid - 2 Comments. Share the post "The Rohingya in Regional Politics"
The “Rohingya crisis” began in 1974 when the Burmese military government took away the Rohingya’s citizenship, claiming they were economic migrants who had traveled to Myanmar during British rule. This ethnic group is thus stateless, with the Burmese government not only refusing them citizenship but engaging in ethnic cleansing. Unlike in 1971 when India found its solution to the refugee crisis (more on this in the next chapter) as a byproduct of a military intervention to “liberate Bangladesh,” Bangladesh has neither the military nor diplomatic power to force a solution on Myanmar (Murshid 2011). New generations of refugees born inside Bangladesh have no access to education facilities, let alone citizenship rights. 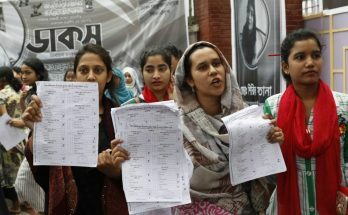 The Bangladeshi state has become increasingly hostile, as is evident from the institutionalization of hate politics through Anti-Rohingya Committees and the closure of income-generating activities and educational provisions outside the camps. The Rohingya have been criminalized. There are no legal means for Rohingya to generate income. Although the Rohingya refugees do not share ethnicity with Bengalis, the Rohingya language is similar to a Bangla dialect called Chittagongian, spoken in Chittagong Division. Although native speakers of both can differentiate between the two, they have little trouble understanding each other. The similar lingua franca has allowed locals to be sympathetic and understanding and prevented them from identifying refugees purely as strangers from a foreign land. However, there are monetary incentives for locals as well. The influx of international organizations, NGOS, and government offices involved in the protection of refugees has spurred an economy based around refugees. Because encamped refugees get rations and a small stipend, they too have become a market for locally available products. Local businesses, therefore, have benefited from the establishment of camps. When asked about their attitudes towards Rohingya, some locals said they were “a disruptive force that will destroy the land, the ecology, and spoil the local culture through pillaging of resources and promiscuity.” However, underneath the overt dislike, the monetary incentives make locals tolerant of camp dwellers, who are officially not allowed to leave the camps but still manage to do so. When fresh violence erupted in Rakhine State in June 2012, causing a fresh flow of people to seek refuge in Bangladesh, Bangladesh declared that it did not have the capacity to host more refugees and closed down the border. This not only prevented people from coming into Bangladesh, but prevented Rohingya in Bangladesh from leaving as well. According to an aid worker in the camp area, the Rohingya have access to small arms and could have engaged in an insurgency in Myanmar. When the military began fresh attacks on Rohingya in Rakhine, the Rohingya in Bangladesh were getting ready to cross over to Myanmar to fight back. The closed borders with heightened security foiled such plans. Does Bangladesh have any incentive to prevent an armed struggle in Myanmar? 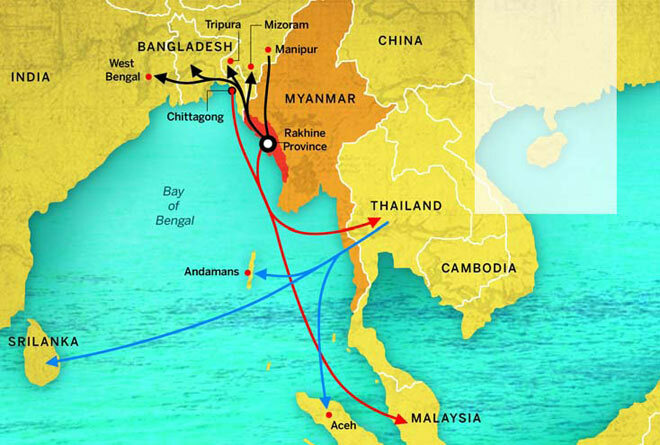 Recently, Bangladesh-Myanmar relations have been contentious over gas exploration in the Bay of Bengal: according to Bangladesh, Myanmar infringed upon Bangladesh’s water territory around St. Martin’s Island, but after an investigation, the maritime tribunal declared that the area was within Myanmar’s maritime boundary. Did Bangladesh fear that it would be blamed for arming the Rohingya if they were to engage the Myanmar military, exacerbating the tensions between the two states? Or are the Bangladesh and Myanmar governments in tacit collusion to project state power by marginalizing the Rohingya? After all, the militaries of both countries claim that Rohingya are terrorists—the Myanmarese military because it does not want to give the Rohingya citizenship, the Bangladeshi military because there is more state funding for the military operating in the region if the refugees are terrorists. When Buddhist temples were burned down by “fundamentalists” in September 2012 (soon after the closure of the Bangladesh-Myanmar border) in Ramu, half an hour away from the refugee camps, a Bangladeshi MP said the Rohingya were responsible for hate crimes against Buddhist minorities (Daily Star 2012). The argument is that the Rohingya refugees could not cross over to Myanmar to protect the Rohingya from attacks by Buddhists in Rakhine; therefore, they attacked the Buddhists in their area as an act of revenge. 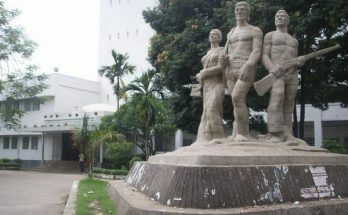 [i] It is noteworthy that there is a significant “Rakhine” population in Cox’s Bazar that has existed since before independence; unlike the Rohingya, they have assimilated into society in such a way that allows them to express their Burmese and Buddhist identities openly and confidently. (The “Burmese” markets across the coastal region bear testimony to that.) No evidence has emerged as yet to prove or disprove the politicians’ claim, but locals I spoke to in the Cox’s Bazar area sang a similar tune: “One has to ask where all the ammunition came from. It is an open secret that the Rohingya have access to small arms,” said one tea-stall owner, implying that these must have come from the Rohingya. The Rohingya are manipulated for domestic electoral reasons as well. One finding that emerged during my fieldwork in 2008 was the manipulation of refugees to gain electoral leverage. A UNHCR officer who worked in both the camps in Cox’s Bazar revealed that the Rohingya are bussed to polling centers during elections to vote for different political parties. The Jamaat-e-Islami party, especially, has often used religion to mobilize refugees, in addition to paying (bribing) them and/or promising them citizenship if elected. In the 2008 elections, the only districts where Jamaat-e-Islami succeeded were Chittagong and Cox’s Bazar. (Teknaf and Ukhyia fall under the latter.) Although such claims are speculative, locals argue that part of the reason Jamaat-e-Islami was successful in gaining two seats was through the mobilization of the Rohingya. Because the Rohingya, especially the unregistered ones, are in such a desperate situation with very little hope for the future, they have been deemed the most vulnerable refugee group in the world by the US Committee for Refugees and Immigrants (USCRI). But they are not only vulnerable—they are prone to manipulation by different groups and parties. Links to terrorist groups emerged because in the past Rohingya were easily persuaded or bribed to carry and transport arms. “Because they have so little to lose and only something to gain, you can get unregistered Rohingya to do almost anything for money. They have been used as pawns for all kinds of illicit activities,” said one aid worker who works with Rohingya in the Cox’s Bazar area. The Bangladeshi state, for its part, continues its contradictory foreign policy. It engages in “quiet diplomacy” in its interaction with the Myanmar government, refusing to bring up the Rohingya issue in bilateral talks, but on the other hand, it continues to wage a low-intensity war against Rohingya—including preventing Rohingya influxes, mistakenly hoping that it will force them to go back home and deter further influx. Part of the reason for this kind of disengagement may be Myanmar’s patrons, namely China and North Korea. With patrons such as these, Bangladesh treads a difficult path, unwilling to get into any kind of embroilment through a series of alliances. A confrontation with either China or North Korea is the last thing Bangladesh needs. “Myanmar pays little heed to the US, the UN, and the EU. Why would pressure from Bangladesh work?” asked a UNHCR employee in Kutapalang. The end result: continued repression of Rohingya in Myanmar, creation of new refugees, and the protraction of the situation. Interestingly enough, the Rohingya are skeptical of “democratic reforms” in Myanmar. Many think that a majoritarian system will only allow the Burman ethnic group to continue the suppression of minority ethnic groups. In fact, many claimed that Aung San Suu Kyi (along with others in the National League for Democracy, or NLD) has brokered a deal with the military government: the NLD, they say, maintains an outward façade of openness while being part of a repressive pact. The fact that Suu Kyi has refused to talk about the Rohingya even when the topic is brought up serves to deepen their suspicion of her. Daily Star. 2012a. “MKA Hints at Rohingya Link With Ramu Violence.” Daily Star, October 1. Available at http://www.thedailystar.net/newDesign/latest_news.php?nid=41299. Guhathakurta, M. 2012. In conversation on October 15, 2012. Guhathakurta, M. 2011. “Partnerships and Solutions for Protracted Refugee Situations.” In UNHCR Panel Report, 2011(Dhaka: UNHCR). Murshid, N. 2012. “Refugee CampMilitarization in Bangladesh and Thailand.” Economic and Political Weekly 47(47-48):103-108. Murshid, N. 2011. “India’s Role in Bangladesh’s War of Independence: Humanitarianism or Self-Interest?” Economic and Political Weekly 46(52):53-60. [i] The same kind of argument was used to attack Hindus in Bangladesh and Pakistan after Hindus demolished the Babri Mosque in Ayodhya, India. Navine Murshid is Assistant Professor of Political Science at Colgate University. She was a Visiting Scholar at Jawaharlal Nehru University’s School of International Studies during the year 2012-2013. She is a member of Bangladesh Development Initiative (BDI), a US based non-partisan, non-profit organization promoting socio-economic development in Bangladesh. 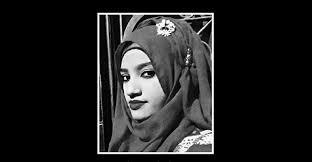 She is the author of The Politics of Refugees in South Asia: Identity, Resistance, Manipulation. Rohingyas are Benglai muslims migrated from Cox’sBazar during British era when all the countires were under the same rule. Their innocent forefathers went to cultivate the barren lands in the other side of the hills in Bandarban which is now part of Myanmar. (Prove me wrong, if any one is interested!) After living for generations, the population suddenly realized that the whole colony has been divided into several countries drawing borders. And now the previous land denies their right to come back home. If I were to decide, I would have welcomed all the Rohingyas back to their original homeland (does it matter if another 3 millions adds up to the already 170 million? my motherland would accomodate them anyway) and side by side negotiate with the Myanmar government so that we both governments show highest empathy to them. Oh yes, I would also ask the UK governemnt to pay some fine for the repatriation of this displaced community! Rohingyas are Benglai muslims migrated from Cox’sBazar during British era when all the countires were under the same rule. Their innocent forefathers went to cultivate the barren lands in the other side of the hills in Bandarban which is now part of Myanmar. After living for generations, the population suddenly realized that the whole colony has been divided into several countries drawing borders. And now the previous land denies their right to come back home. If I were to decide, I would have welcomed all the Rohingyas back to their original homeland and side by side negotiate with the Myanmar government so that we both governments show highest empathy to them. Oh yes, I would also ask the UK governemnt to pay some fine for the repatriation of this displaced community! Next Time, Please bring some Historical Reference. we are not economic migrant. Some racist neo-nazi making propaganda about history of Rohingya. The target The Disowned and the Denied. Stateless Rohingya. Like Nazi did with European Jew.